This Company established its operations in India in 1931 as a branch of The Cementation Company Ltd,UK, a member of Trafalgar House Group of London, for carrying out extensive grouting and drilling works to the hydraulic structures which were then growing at rapid pace. Since then the Company has been assiduously working towards building stronger India and has gained vast expertise in field of infrastructure construction. 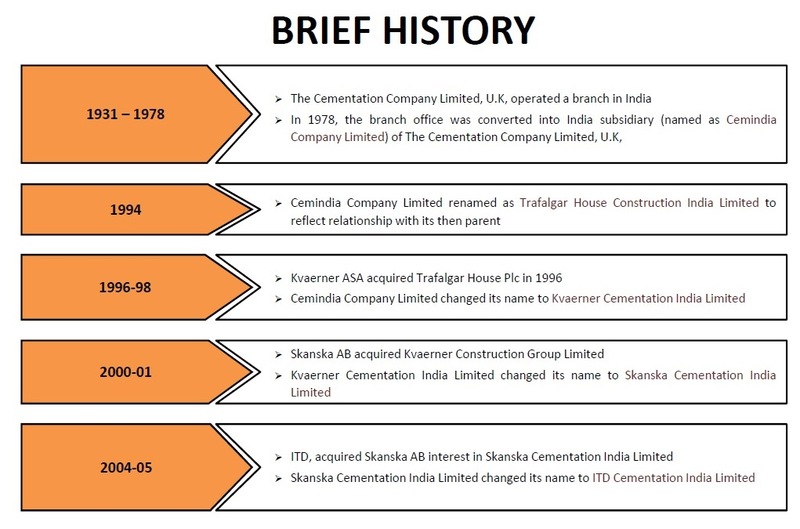 The Cementation Company Limited of the United Kingdom (‘CCL, U.K.’), a member of Trafalgar House Group of the United Kingdom was operating as a Branch in India and had its presence in construction activities in India since 1931. Reserve Bank of India, in 1978, had granted permission to CCL, U.K. to continue to carry on its activities in India subject to India branch of CCL, U.K., being converted into an Indian company. The Company was incorporated on 1978 as Cemindia Company Limited and obtained Certificate of Commencement of Business on 6th November, 1978. In 1994, The Company changed its name to Trafalgar House Construction India Limited in order to reflect direct relationship with its then holding company and obtained fresh certificate of incorporation on 7th September 1994. In the year 1996 Kvaerner ASA, acquired Trafalgar House Plc. Consequent upon this acquisition the Company changed its name to Kvaerner Cementation India Limited and obtained Fresh Certificate of Incorporation on 1st September, 1998. In the year 2000 Skanska AB, entered into an agreement with Kvaerner Plc, to acquire the entire issued share capital of Kvaerner Construction Group Limited. Pursuant to the transaction, the control of this Company changed from Kvaerner ASA to Skanska AB. Pursuant to the requirements of SEBI Takeover Code Skanska AB made an offer to the public shareholders of this Company to acquire fully paid up equity shares of this Company. Subsequently the Company changed its name to Skanska Cementation India Limited and obtained Fresh Certificate of Incorporation on 11th July, 2001. In the year 2004 Italian-Thai Development Public Company Limited, Thailand entered into Share Purchase and Sale Agreement with The Cementation Company Limited and Skanska AB. Thereupon the Company changed its name to ITD Cementation India Limited and obtained Fresh Certificate of Incorporation on 26th May, 2005, As one of the largest Civil Engineering Contractors in South East Asia, The Strong Parentage has furthered the Company’s Momentum in acquiring large infrastructure Construction projects across India.